Namaste Mari: Is it time to go home yet???? Is it time to go home yet???? I was hoping to feel better this morning but instead I feel worse. I wanted to call in at the gym but since I am the only one here on Saturdays, I had to come in. 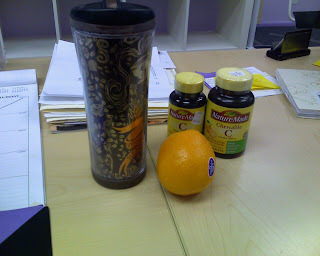 So far this morning I drank tea (no coffee today) ate an orange and I have been popping vitamin Call morning. AWH, Hope you feel in tip-top shape soon!